private mortgage insurance (PMI), available from private insurers. The rate of default insurance premium and the underlying interest rate vary depending on the LTV. The MIP rate for an FHA mortgage with a 3.5% down payment remained at 0.85%, while the PMI rate for a similar mortgage with a 5% down payment decreased slightly to 0.68% as of April 2019. While the PMI rate is currently cheaper than a similar 30-year mortgage with MIP, conventional mortgages requiring PMI tend to have higher mortgage rates than FHA mortgages. 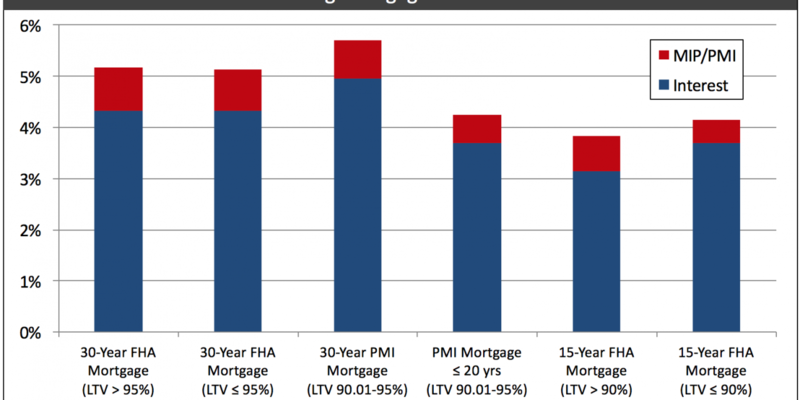 Therefore, FHA-insured mortgages continue to be slightly less expensive for buyers than a similar mortgage with PMI. Fixed-rate mortgage (FRM) rates rose considerably in 2018, but have fallen back in recent months. As of April 2019, the average 30-year FRM rate is 4.05% and the average 15-year FRM rate is 3.46%. Rising rates reduced purchasing power in 2018 and discouraged buyers, which caused the market to slow going into 2019. 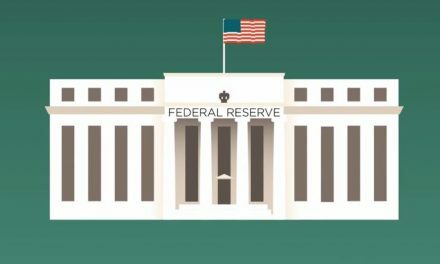 Even though FRM rates have fallen back since then, the market continues to slow in 2019 and is expected to continue as we head towards the next recession, anticipated in 2020. Updated April 10, 2019. Original copy posted August 2011. This chart tracks the total percentage rate paid on principal for mortgage default insurance (mortgage insurance) paid by homebuyers who make a down payment of less than 20% of the price they pay for a home, including premiums and interest due on 30- and 15-year FRMs. Editor’s note – Mortgage rates obtained from an independent source to compare 30- and 15-year FHA FRM rates with conventional 30- and 20-year FRM rates. private mortgage insurance (PMI), an alternative form of default insurance available from private insurers. All premiums are provided by PMI and MIP insurers. Rates shown are sample rates for mortgage commitments in the U.S.-West, as reported by Freddie Mac. The western region includes CA, AZ, NV, OR, WA, UT, ID, MT, HI, AK and GU. PMI rates listed on the chart are the average rates offered by California’s two largest PMI providers: MGIC, and Genworth Mortgage Insurance Co. The PMI rates are for 30% loss coverage on 30-year and 25% loss coverage on 20-year conforming FRMs originated at a loan-to-value ratio (LTV) of 90.01%-95% on appraised value, secured by the single family residence (SFR) occupied as the primary residence of a homebuyer with an average credit score of 700.
impounds (TI) for MIP/PMI, which may encompass hazard insurance premiums, property taxes, HOA assessments and payments on Mello-Roos improvement bonds. Thus, the inclusion of MIP/PMI in the total monthly payment diminishes buyer purchasing power by reducing the amount the buyer can borrow for failure to have at least a 20% down-payment. The MIP offered by the FHA is made available to insure lenders against losses on a default in mortgages originated with homebuyers who obtain a low-down payment — typically 3.5%. PMI is the only alternative to mortgage insurance issued by the FHA. PMI insurers along with the mortgages they insure require higher down payments and have more stringent credit score requirements than the FHA, but they also tend to offer lower premium rates with higher down payments. an LTV less than or equal to 90% allows the MIP be removed after 11 years. 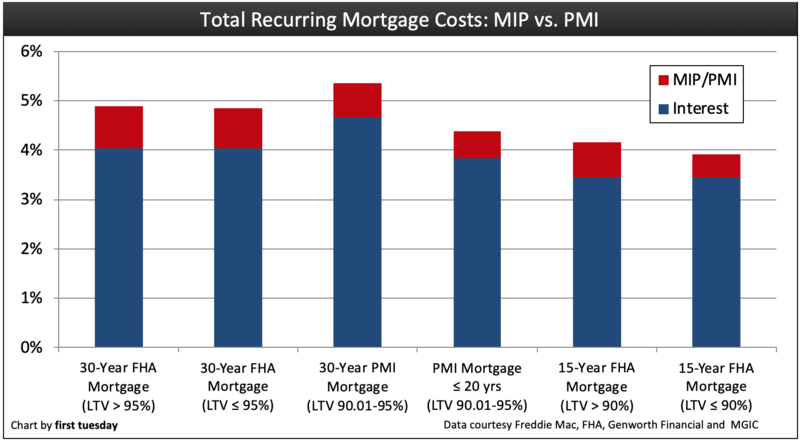 Thus, use of PMI offers homebuyers some additional advantages over the FHA’s MIP. 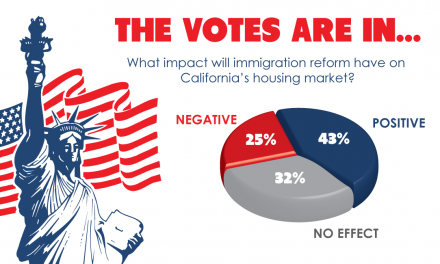 In August 2014 — the last month for which data is available — 19% of Southern California mortgages were insured by the FHA, according to Dataquick. This is level with one year earlier. The remainder were either uninsured (meaning they made a down payment of over 20%) or covered by PMI. Buyers with sufficient cash on hand to submit a higher down payment can do still better: if the down payment is greater than 20%, PMI coverage is not required by lenders. However, in rare instances, when a borrower with 20% down only qualifies for FHA financing, MIP is required regardless of the down payment. The homebuyer who has the financial ability to make a 20% down payment comes out ahead of the homebuyer whose insufficient down payment requires default insurance for the lender. Without 20% down, they are forced to pay the annual PMI fee, which is regressively based on the entire mortgage amount due. This adverse leveraging turns an MIP/PMI premium of 1% of the mortgage balance into a charge to the borrower of 6-16% on the additional funds needed to increase a down payment to 20%. Though the additional savings paid upfront to increase the down payment and avoid the insurance premium does not earn interest in a bank account, this opportunity cost for moving funds from savings or investments to avoid PMI insurance is well worth it. Thus, while the homebuyer may gain some interest earnings by holding onto their cash savings, the costs of holding onto the cash are far greater than the earnings a savings account will pay. For instance, consider the homebuyer who purchases a property priced at $300,000 with a 5% down payment ($15,000). To fund the remainder of the purchase price, the homebuyer opts for a 30-year FRM with mortgage insurance. With a down payment of less than 20%, they are required to provide and pay the premiums for PMI, an additional annual cost equal to 0.87% of the mortgage balance. The homebuyer has savings or access to funds for another $45,000 which may be used to bring the down payment to the 20% mark and avoid PMI. Applying this leveraging situation to our $285,000 95% financing, the PMI premium charge payable for the first year will be roughly $2,480. This premium is entirely avoided if $45,000 is withdrawn from savings and used to increase the down payment to 20% of the price. The $45,000 is only earning 1% in a bank account — $450 annually — which will be forgone (the opportunity cost) on use of the savings to increase the down payment amount. Thus, the additional $45,000 used to increase the down payment to avoid PMI premiums earns $2,480 the first year; a 5.51% annual rate of return, five times more than earnings on the savings withdrawn to raise the down payment to 20%. Each year following will realize slightly lesser amounts “saved” until the mortgage principal is reduced or the home increases in value to an LTV of 78%, or five years pass and the mortgage insurance is no longer required. Editor’s note — This yield for PMI avoidance is in addition to the implicit rent a homeowner “receives” for the use of their property, a return on the price paid for the property which is attributed pro rata to the down payment. Homebuyers who can make a 20% down payment need to be advised of the option available to them, if not directly encouraged by their agents to make the payment. A down payment large enough to avoid mortgage insurance coverage enables buyers to reduce their monthly recurring costs of homeownership for five years. The result: a higher rate of return than would otherwise be received on the amount of the homebuyer’s savings when used to make the greater down payment and avoid the cost of MIP/PMI. NextPOLL: How often are deals contingent on new financing killed by low appraisals? AS a Mortgage Banker who has closed many Short Sale Purchases with a 2nd loan in California I see a 10% buy out to the holder of the 2nd. Although I am not in on the up front paper work concerning the Short Sale Agreement I do see the final Agreement and Bank Approvals on the Short Sale. What I am seeing here is a 10% buyout either all from the holder of the First or a combined 10% buy out with the holder of the first and the new buyer. On a $30,000 2nd loan the $3,000 buy out on that 2nd could be paid by the new Buyer or paid 1/2 each from the holder of the first note and the new buyer. I have also seen the Real Estate Agent for the Seller and the Buyer agreeing to a small reduction in Commission on that 10% buy out on the 2nd to make the Short Sale Purchase happen. I do not understand why some lenders who hold the 2nd note would decide to take nothing over a little must center around some kind of a tax advantage that I have not heard about. I too would love to know why this is taking place. In California the lenders have no recourse on collecting either way unless they agree to a short pay off of the loan, so why not go for it. I do not get it. Im not sure if you can answer my question, have you had any experience with GMAC FIXED SECOND (E-TRADE) IS THE INVESTOR.My client has lost 1 buyer because they will only release the lien and not the liability (this is a investment property) and they are now on there 2nd buyer and e-trade is demanding 11,000.00 on a 30,000.00 second.The first has offered them 3,000.00 and theseller has offered 5,000.00 to settle.The luck as of yet. The selling agent is at a lost and has no idea how to proceed,should we just throw our hands up and say ill be sending the keys in …start the forclousure process and E-TRADE geys no money.Thanks for your time.